A grandfather took his grandson out fishing for the first time. The grandfather taught the grandson all the tricks of the trade. The best way to bait the hook. The best way to cast the line. The best way to tell if you were in a good fishing spot. The best way to tell if there was a fish nibbling on the bait. And even the best way to reel a fish in. But the grandfather forgot one very important lesson. As they stood together in silence fishing. 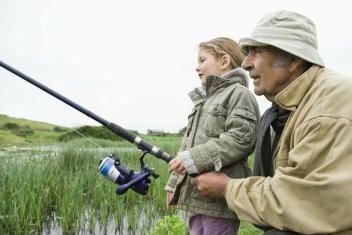 Do you know the important lessons about fishing that the grandfather forgot to teach his grandson? There is a lot of preparation, waiting, and disappointment in fishing. As fishermen, some of Jesus’ first disciples should have known these same principles would apply to following Jesus. Yet, how quickly they forgot. As we consider the story of the Risen Lord appearing to the disciples on the shores of Galilee, I am surprised that once again they have forgotten the ups and downs of the faith life. There is much preparation needed, quite a bit of waiting, sprinkled with moments of disappointment. In John 21: 1-19, we encounter the story of Simon Peter, Thomas, Nathanael, James, and John as they have gone out fishing all night, but catching nothing. Perhaps they think that after Jesus’ death, they will simply go back to their old lives and their previous vocations. They come back early in the morning, tired and frustrated. On the shore stands Jesus. His call to them is to go back and try again. Jesus gives them instructions as to the next step. He tells them to put the nets out of the right side of the boat. They follow his instructions. Lo and behold, for a second time, they encounter a miraculous catch in the presence of Jesus. Once again, they have been slow to recognize the presence of Christ in their midst. This is yet another example of how the disciples do not fully understand the power of Christ. What I find so endearing about such stories of the disciples is how easy we can see ourselves in them. After Jesus’ death and even his resurrection, they essentially forgot who they were and whose they were. They became too frightened, too overwhelmed to see that the power of the Risen Christ could continue to work through them if they were faithful in living out the love of Christ. Sometimes in the church, we like the first disciples, have moments when we forget who we are and whose we are. We know we have been sent out to fish, but it feels like we are just drowning worms. We fret about the work to which we have been called. We wring our hands, focusing on what we do not have instead of the abundance. We make it too difficult. We become distracted by projects and programs that in the end will do nothing to bring more light, joy, grace, and love into the world. If only we could remember the principles of fishing and apply them to our shared faith lives. In the Church, we need to remember there is much preparation needed, quite a bit of waiting, sprinkled with moments of disappointment. Yet, the glorious good news is when we continue to be about the “fishing” work, we will encounter the Risen Christ in our midst. If we open our eyes to truly see how the Spirit is working around us, we see the small miracles of the divine.